ProWrap is the new versatile and scalable turntable semi-automatic machine for intensive and demanding stretch film applications, able to optimise film consumption and to guarantee full control of all wrapping parameters throughout the cycle. 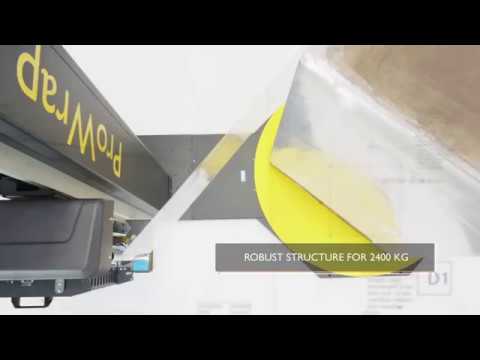 ProWrap is a high-end machine designed in accordance with Industry 4.0 concept, ProWrap ensures optimisation and safety of the transit packaging. The ProWrap guarantees saving of resources and time and supervision of machine productivity (up to 30 plts/hour), its working time and film consumption. Thanks to ProWrap’s advanced setting options, which consist of 12 programs and 5 operating modes, you will be able to optimise your packaging process while increasing the stability of the wrapped load. The list of options available, such as pressing unit, roping device or a variable pre-stretch up to 400% (with double motor carriage), allows you to configure SIAT ProWrap according to your business needs. Furthermore, the option of having a different amount of film in different areas of the pallet (6 upshift zones, 5 downshift zones) guarantees savings in film. ProWrap will protect the load during the transportation and avoid wasting film. All SIAT equipment carries a 12 month (single shift) warranty (parts and labour) given normal wear and tear.